These plugins must be made available by your site admin. To administrate these plugins, go to the Bot Mattermost plugins section. To use this feature, BotMattermost-Git plugin must be installed and available for the project. Go in your tuleap-git repository and click on Settings. In the Notification section, you have the possibility to link bots previously created with the repository. After that, every push effectuated on this repository will be notified in Mattermost. 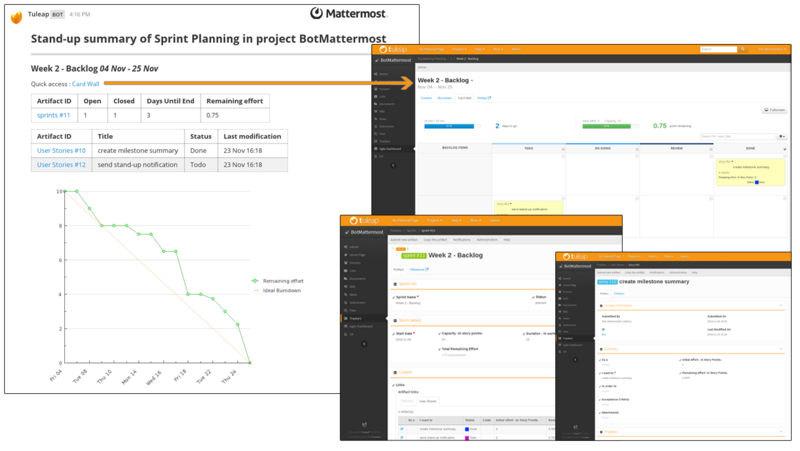 To use this feature, BotMattermost-Agiledashboard plugin need to be installed and available for the project you need to use. Go in your project and select Agile Dashboard service. In Admin section click on Notification pane. Fill the form and select the bot that should send the stand-up summary. Now, every day, you will receive your stand-up summary in your Mattermost every day after the report time.